The response to my free WordPress installation service has been overwhelmingly positive and is the talk of the Blogosphere. Even WordPress founder, Matt Mullenweg, noticed. I know this because Matt emailed me to recommend some more plugins I should include with the service. Hey, if Matt says to add these plugins, I’m not going to argue! So, all WordPress installations will include the following plugins installed for free. All In One SEO for WordPress will help your blog rank higher with the search engines. Google Sitemap will help get your blog pages indexed quickly on Google. W3 Total Cache will make your blog load a lot faster and handle more traffic. Show Top Commentators encourages readers to comment. WordPress.com Stats will let you know who is visiting your blog. Akismet kills off the comment spam and After The Deadline will proof read your blog post for grammar and spelling. These are some of the best WordPress plugins available and they’re included free with the WordPress installation service. My blog is powered by the Thesis Framework theme. This is a highly customizable theme that allows people without design or coding skills to easily change the look and feel of their blog. It is also the most SEO friendly theme available. If you choose to have Thesis installed, All In One SEO will removed. You won’t need it since Thesis has even better SEO features. To add Thesis to your free WordPress installation, order the theme at DIY Themes, then forward the email they send to you and I’ll install Thesis for you at the same time as WordPress. This program is being sponsored by HostGator. They are my official web host and host all my blogs. They are the ones paying me to do this. If you were to pay someone to install WordPress, Thesis and the seven plugins for you, it would cost you over $100. Word class web hosting doesn’t have to cost you an arm and a leg. 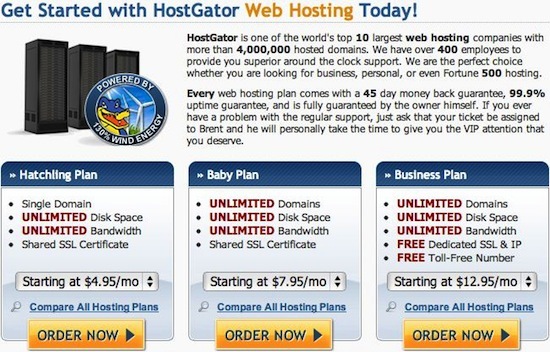 HostGator WordPress hosting plans start as low as $4.95 per month. However, I have a coupon code that will give you the first month hosting for only 1 cent. Simply order the plan of your choice and enter coupon code JohnChowRocks into the coupon field at checkout. This will reduce the first month price of the hatching and baby plan to 1 cent and the business plan to $5. I recommend you go for the baby plan as a minimum because it will allow you to host as many domains as you want. Not only will you get your first month for a penny but every hosting plan at HostGator comes with $100 of Google AdWords credit that you can use to promote your new blog. Spend 1 cent to get your blog up, get WordPress and plugins installed for free and get $100 of AdWords credit. You won’t find a better web hosting deal anywhere!